101108 - Up and saw the boys off to school. Got my coffee and reading done. Good morning call then steady all day. Dennis stopped by and helped me get the dryer electric in to code. Finished up my day and had a nice dinner with the fam and they told me all about going to the zoo today. 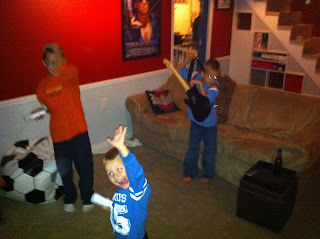 We got the trash out and down to the basement for some Wii time. All boys to bed and I'm off to meet the Bible Bangers.